This past week we held our economic forecast event: Future Fortune: What’s Ahead for the Regional Economy. Lynn Valenter kicked off the event by announcing IMS’s new data tool, Neighborhood Pulse. Then I provided a quick snapshot of the state of the regional economy (you can find the powerpoint here). Jason Jurjevich discussed migration trends, and Christian Kaylor discussed wage and employment trends. Tom Potiowsky provided us a summary of his regional economic forecast. One of the most interesting trends I took from the event was the distribution of job growth by wages. This chart, provided by Christian, shows that over the past ten years, jobs in industries whose wages fall in the middle of the wage distribution have barely grown, while those at the top of the wage distribution, which typically require greater amounts of education and experience, have grown much more quickly. But the fastest growing occupations are the low wage jobs that require little or no post-secondary education. Thus, while low-skill workers have plenty of job opportunities, their average annual wages are quite low—too low, in many cases, to meet the region’s self sufficiency standard. This ties to another trend that we just recently started tracking on Greater Portland Pulse, wage distribution. It shows the ratio of the 90 percentile wage (the wage at which 90 percent of jobs pay less) to the 10 percentile age (the wage at which 10 percent of the jobs pay less). 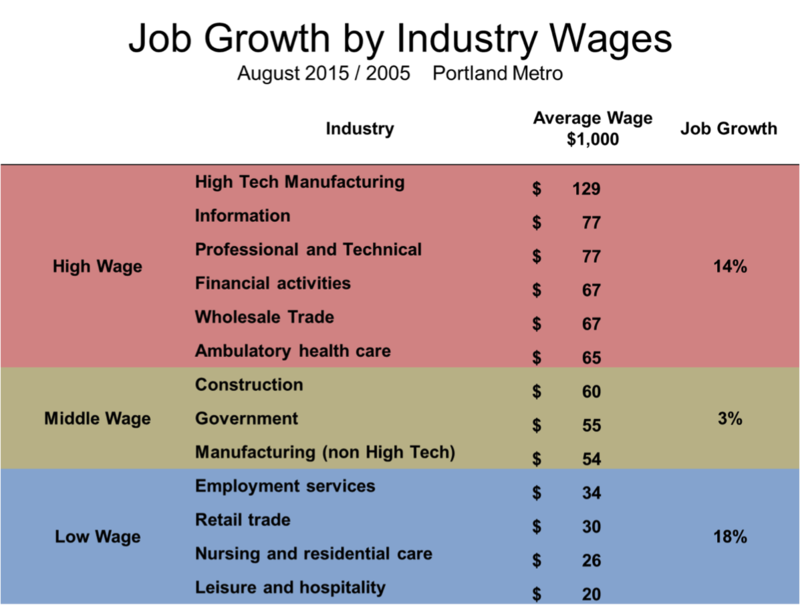 A higher ratio indicates a greater wage divergence between lowest and highest paid workers. The ratio has been rising over the past ten years, and although the ratio for the Portland region is lower than that of the nation, we are closing the gap. And the New York Times’ Steven Greenhouse showed us over the weekend that stagnating wages are a national trend for the typical American worker. Expand the middle wage jobs that have traditionally provided a self-sufficient wage, even for workers without a great deal of formal education by expanding markets for our manufactured goods. Greater Portland Inc’s Global Trade and Investment Plan is one example of a strategy for doing that. Offer more opportunities to upgrade low-skill jobs to increase worker productivity while providing a skill and career ladder for lower wage workers. Portland Community College has a number of career pathways programs that lead from lower-wage positions such as retail sales clerk and entry-level maintenance worker, to higher paid positions in customer service and facilities management. Ensuring that employers recognized and reward these credentials is also critical. Ensure that more workers complete the secondary education required to enter higher wage occupations. This requires that we stay focused on keeping kids on track for an on-time graduation from high school, making secondary education affordable, and ensuring that kids are aware of the careers available to them with post-secondary education. The All Hands Raised Partnership’s High School to College and Career Collaborative is gathering data and developing strategies related to this issue. The truth is, we need to keep working this issue of low and stagnant wages from all of these angles. No one approach can work for all of our workers currently earning salaries that are too low to support themselves or their families.